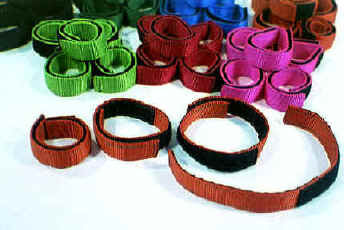 HANDY VELCRO WRAPS AVAILABLE IN WEBBING STYLE OR SUEDE. 1001 USES! MADE IN USA You'll never have enough of these handy 14" webbing or suede strips lined with velcro hook and loop. Use them to secure fuel hoses, radio antennas, loose lines. Great for hanging items around the basket or from fuel tanks. My kids use them to wrap around their pant legs to keep them from getting caught in their bicycle chains! COLOR CHOICES FOR THIS ITEM: Royal Blue, Red, Black, Orange, Pink..
A SAFE, SECURE WAY TO ATTACH LINES TO THE CROWN RING OR OTHER PLACES IN YOUR BALLOON SYSTEM. ELIMINATES THE WEAR AND TEAR OF DIRECT METAL-TO-METAL CONNECTIONS. MADE IN USA Many balloon manufacturers are recommending or insisting that no metal-to-metal connections are allowed on some components of their balloon systems. Small burrs on items such as crown rings are said to cause premature chafe-type wear on critical load-bearing webbings. Our webbing attachment adapters are the perfect solution to this dilemma. Short lengths of high strength webbing with loops on each end provide wrap-around or slip knot style attachment points for your crown line, tether ropes, or tie-off lines. COLOR CHOICES FOR THIS ITEM: Royal Blue, Red, Black. ATTACHMENT ADAPTERS, 12 INCH MADE IN USA #AA12 1/4 LB $19. ATTACHMENT ADAPTERS, 18 INCH MADE IN USA #AA18 1/4 LB $24. ATTACHMENT ADAPTERS, 24 INCH MADE IN USA #AA24 1/2 LB $30. ATTACHMENT ADAPTERS, 30 INCH MADE IN USA #AA30 1/2 LB $35. 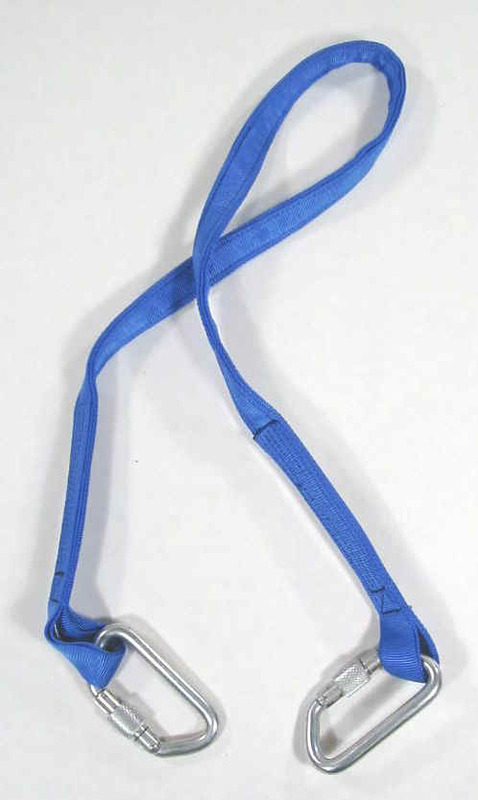 HIGH STRENGTH WEBBING HARNESS FOR GENERAL PURPOSE ATTACHMENT OF QUICK RELEASES, TIE-DOWNS, TETHER LINES, ETC. MADE IN USA Our Two Point harness is fabricated from high tensile strength webbing. Comes with two Locking Aluminum D carabiners. Overall harness length is 48 inches. We can fabricate custom harnesses of any length. 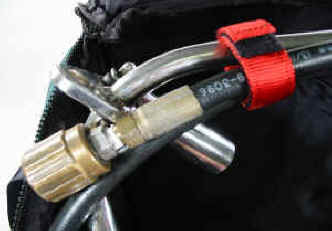 See our Two Point Snap Shackle Release which pictures the Two Point Harness described above. OUR RUGGED ATTACHMENT STRAP IS DESIGNED TO HELP ELIMINATE WEAR AND TEAR ON YOUR EXPENSIVE LINES. MADE IN USA Attach our chafe-protected, durable strap to your vehicle for maximum hold strength and line protection. 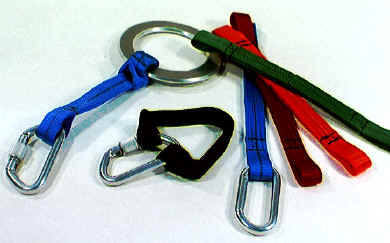 Your tie-down or tether line can now be attached easily via a locking carabiner. No more chafe wear, surface cuts, dirt, oil, or grease on your expensive lines! Brightly colored for safety. Note: Colors may vary from item pictured above.